Performed by: Ryan Jordan, Julien Ottavi, Kasper T Toeplitz, Jean-Baptiste Thiebaut, John Bowers, Dominique Leroy, Philip Julian, Chris Weaver, Jenny Pickett, Ryo Ikeshiro, Dawn Scarfe, Andy Wheddon, Duncan Ravenhall, Antonis Antoniou, and more. Thanks to ResonanceFM for their support! David Tudor was born in Philadelphia, PA, in 1926. He studied with H. William Hawke (organ, theory), Irma Wolpe Rademacher (piano) and Stephan Wolpe (composition and analysis).His first professional activity was as an organist, and he subsequently became known as one of the leading avante-garde pianists of our time. Tudor gave highly acclaimed first or early performances of worksby contemporary composers Earle Brown, Sylvano Bussotti, Morton Feldman, Karlheinz Stockhausen, Christian Wolff, Stephan Wolpe, and La Monte Young, among others. Tudor began working with John Cage in the early fifties, as a member of the Merce Cunningham Dance Company and with Cage’s Project of Music for Electronic Tape. 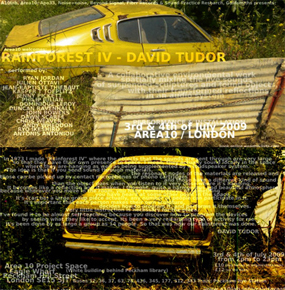 Tudor gradually ended his active career as a pianist, turning exclusively to the composition of live electronic music. As a composer, Tudor chose specific electronic components and their interconnections to define both composition and performance drawing upon resources that were both flexible and complex. Tudor was one of four Core Artists who collaborated on the design of the Pepsi Pavilion for Expo ’70, Osaka, Japan, a project of Experiments in Art and Technology, Inc. Many of Tudor’s compositions have involved collaborative visual forces: light systems, laser projections, dance, theater, television, film. Tudor’s last project, Toneburst: Maps and Fragments, was a collaboration with visual artist Sophia Ogielska. Tudor’s several collaborations with visual artist Jacqueline Monnier included the development of a kite environment installed at the Whitney Museum (Philip Morris, NYC) in 1986, at the exhibition “Klangraume” in Dusseldorf in 1988, and at the Jack Tilton Gallery in New York City in 1990. Other collaborators have included Lowell Cross, Molly Davies, Viola Farber, Anthony Martin, and Robert Rauschenberg. Tudor had been affiliated with the Merce Cunningham Dance Company (MCDC) since its inception in the summer of 1953. In 1992, after Cage’s death, Tudor took over as Music Director of MCDC. Merce Cunningham has commissioned numerous works from Tudor, including Rainforest I (1968); Toneburst (1974); Weatherings (1978); Phonemes (1981); Sextet for Seven (1982); Fragments (1984); Webwork (1987), Five Stone Wind (1988), Virtual Focus (1990); Neural Network Plus (1992); and most recently Soundings: Ocean Diary (1994) for what was John Cage’s last conception, Ocean.